In Windows 10, press-and-hold or right-click on the Start button and choose Command Prompt (Admin). In the Command Prompt window, tap or click the upper left of the window to open the command menu. Choose Edit, and then select Paste to paste in the command. Hmmm..it did not work for me.. So I went for the below one and got repaired. In Windows 10, right-click on the Start button and choose Control Panel. Select Programs – Uninstall a program, or Programs and Features. Choose the entry for your Office program and select Change. Select Online Repair and click Repair. 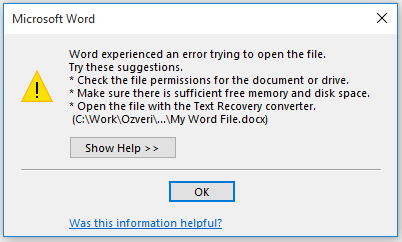 Once the repair is complete, your files should open without any error.